As part of the climate target of the Netherlands, Rijkswaterstaat (Ministry of Public Works & Waterways) investigates where in its territory renewable energy can be generated. The A37 motorway has been chosen as a pilot to investigate on a design level in what way solar energy generation is possible while maintaining spatial quality. 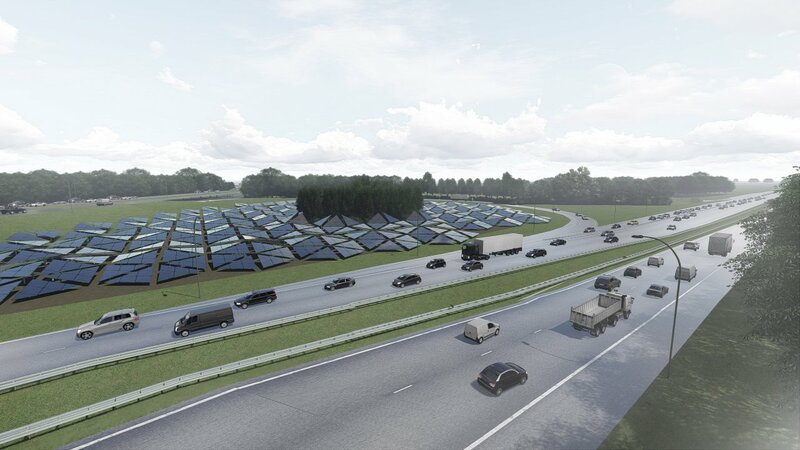 The result should be a spatially inspiring concept for a large-scale generation of solar energy on and along the A37, between now and a period of 15 years. The A37 can thus develop into an iconic solar route and become the basis for further developments at other Rijkswaterstaat locations. The spatial concept Solar Chain is based on energy generation on a limited number of points in the highway landscape: around traffic junctions, exits, rest areas and the border. This creates a pearl cord of power generation, binding solar energy to the highway landscape. This concept offers significant benefits. Spaces between junctions and exits remain free from solar panels. These spaces in between show precisely those characteristic open landscapes along the A37. Near junctions and exits business parks, industrial and residential areas, greenhouses and gas stations with connections to the medium-voltage network are situated. This means that few cables need to be installed from the panels to the electricity grid. This makes the business case more attractive. Each junction and every exit in the Netherlands is different. 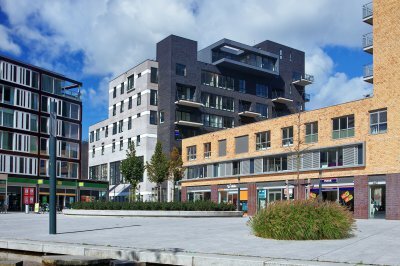 The project therefore needs a flexible system that responds to all those distinctive qualities, adapts to the shapes and elements in a junction and at the same time is recognisable throughout the entire route. The possibilities for this are limited with the standard solar panels. That is why we introduce a modular flexible solar panel consisting of an equilateral triangle, one of the strongest architectural shapes. After all, it is switchable along all sides and combined, can form almost every shape. The solar panels form sculptures that respond to the specific features of the junction / exit. This creates continuity and unity along the A37, while at the same time keeping the junctions distinctiveness in the specific design of the place. Using this new panel, sample implementations have been made for different situations along the A37, also in 3D using VR technology.